"Enticed by advertisements for a newly restored palatial hotel and filled with visions of a life of leisure, good weather and mango juice in their gin, a group of very different people leave England to begin a new life in India. On arrival they are dismayed to find the palace is a shell of its former self, the staff more than a little eccentric, and the days of the Raj long gone. But, as they soon discover, life and love can begin again, even in the most unexpected circumstances." Film tie-ins are rarely going to have a negative effect on the reception of an author's work, but equally rarely does it raise awareness, as many of the films that are spawned by books are by authors that are already well-known. Think of recent releases: The Life of Pi, Cloud Atlas, Les Misérables, Anna Karenina and The Great Gatsby are all by established authors whose canon (whether in whole or in part) is considered classic. However, one hopes that the 2012 release of The Best Exotic Marigold Hotel will have significantly boosted the profile of writer Deborah Moggach, whose novel-publishing history in fact stretches back more than thirty years. If done well, the film should have encapsulated Deborah Moggach's engaging plot successfully, as well as managing to recreate the unforgettable characters with which it is peopled. Novels tend to focus on the young, whereas Moggach has chosen to zoom in on a group of old folks whose families are trying desperately (for various reasons) to send them off to the nearest retirement home. Such an approach perhaps risked being stuffy or predictable, but in the author's capable hands there was not only chemistry between the group (and sparks flying between individuals) but fiery personalities to keep readers amused when characters were alone. Varying degrees of intellect and likeability help, too, to create a realistic cast. This is followed up right the way through their lives' outcomes: the fact that not all of the pensioners sail off into the sunset is also a true reflection of what we can expect in real life. Juxtaposed with this dose of reality is the idyllic setting of India, where much is made of the awe-inspiring sunsets, distinctive streets, tourist attractions and unique bazaars. However, even here Moggach does not pull any punches, equally taking the opportunity to highlight India's problems of poverty and access to education and health services. Nonetheless, in doing so, she does not make her novel into a deliberate polemic: her commentary on Indian society does not go into detail and as such, is no more than another part of her story's patchwork, which also incorporates poignancy, a thrusting plot, and great humour. Humour is the main characteristic of The Best Exotic Marigold Hotel, and even if at times we can see where the jokes are going, this does not in the end make them any less amusing. A secondary, but also important, feature is the book's revelatory nature: not only does Moggach carefully control what we learn about her characters and when we learn it, but she also keeps them on an equally tight leash, only letting them realise new things about themselves at meticulously chosen moments. This, too, leads to the reader's own realisations: not just about their own attitudes to their elderly relatives, but also about what we would like for ourselves when we become old. The book's original title, These Foolish Things, is an interesting extra dimension to the novel, as throughout the characters' attempts to grasp their new surroundings and whether or not they have been satisfied with their long lives, there is a persistent theme of them firstly hanging doggedly onto objects that we might consider frivolous, which is a way of distracting them from or enabling them to cope with their various states of desperation; and secondly, wondering if they are worrying over nothing. Thirdly, the book's original title could have ironic undertones: things, people or decisions in our lives that we could consider foolish or unimportant can actually turn out to be very important indeed with the hindsight that old age provides. Readers will therefore be left with a sense of satisfaction and enlightenment, and a feeling that they have been entertained by high-class writing. 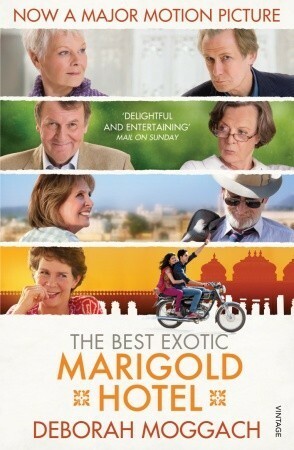 Moggach's powers of description, momentum, character-building and humour are not to be ignored, and whether you have read The Best Exotic Marigold Hotel, or seen the film, or both, it will surely spur you on to investigate the rest of her work.